Lemon Law Claim When a Dealer Can’t Diagnose a Problem | The Consumer Law Group, P.C. Can I file a Lemon Law claim when the dealer can’t figure out what’s wrong with my new car? There is nothing more frustrating than having a problem with your new car that the dealer can’t or won’t fix. You may experience a strong vibration at a particular speed or find that the brakes lock up unexpectedly from time to time. When you take the car to the dealership and explain your problem, you are met with questions and doubt. The mechanic takes the car to diagnose the problem and tells you he cannot find anything wrong with it. The dealer may say that there is a “failure to duplicate” the problem and you are left hanging. Why does this happen and what can you do? 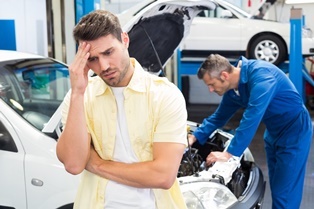 When you bring your car to the dealership for repair while it is still under warranty, you may not be getting top-quality service. This is because the cost of a warranty repair to the dealer is reimbursed by the automaker, but at a pre-determined rate. Common fixes are allotted a maximum labor time by the manufacturer and the dealer will only be reimbursed that amount, no matter how long the repair actually takes. This discourages some dealers from taking the time to properly diagnose and fix your problem. If the car is still under warranty and the problem you are having is difficult to diagnose, the dealer risks losing money on the repair. Less reputable dealerships will instead tell you that they were not able to duplicate the problem, or that the vehicle is operating as designed. Go to another dealership. If the dealership where you bought your car is unable to identify the problem after two attempts, go to another dealership. Each dealership is independently owned and operated and the guy down the street may be more cooperative. Keep all paperwork. Every time you take your car in for service, the dealer mechanic must fill out warranty paperwork. Be sure to ask for your copy—even if no work is completed, or the dealer claims NPF (no problems found). This will establish a paper trail of your efforts to repair the car. Pay an independent mechanic to diagnose the problem. While a warranty repair should cost you nothing, it may be worth it to pay a trusted mechanic to evaluate and diagnose your problem. While you should not have him actually make the repair as that could void the warranty, returning to the dealership with a written evaluation of the problem could either solve the problem or at least provide support for a Lemon Law claim. Hire an attorney. A Lemon Law attorney will be able to gather the information you need to support a claim for reimbursement or replacement of your vehicle. If you think the Consumer Law Group can be of assistance in pursuing a Lemon Law claim in Virginia, please fill out the form on this page for a free case evaluation.